New French-Cuban jazz outfit Que Vola? is set to release their debut album, ‘¿Que Vola?’ on January 25, 2019 via French imprint Nø Førmat! (Oumou Sangaré, Mélissa Laveaux, ALA.NI, Blick Bassy). ¿Que Vola? “What’s up?” – that’s how Cubans like to greet each other. They like it so much that the phrase is common currency in the heavily-accented street slang of the island. 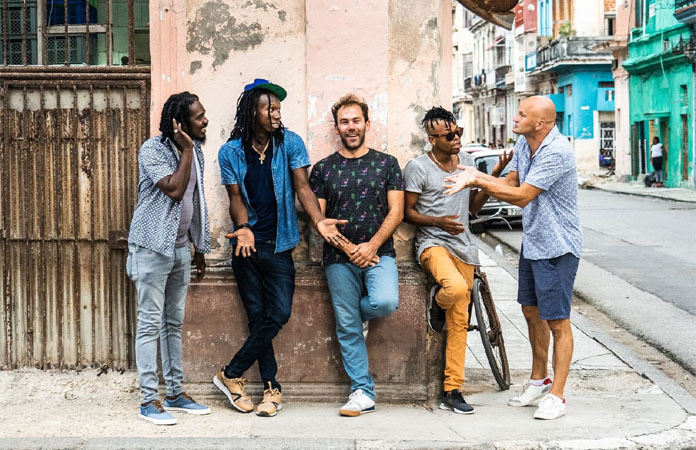 It’s now also namesake to a unique new collective bringing together a French jazz septet with three young and talented Cuban percussionists, marrying dizzying virtuosity with the Afro-Cuban divinities that underpin Cuban music. It all started with a journey – in 2012, French trombonist Fidel Fourneyron headed to Cuba to learn more about the country that inspired his name. He packed little more than his instrument and one Havana address : Calle Luz – ‘the street of light’. It was recommended by his friend, the double-bassist Thibaud Soulas, who’d previously lived there with Cuban family. Soulas had returned to France with a bulging address book, including the names of three remarkable percussionists – Barbaro Crespo Richard aka ‘Barbarito’, Ramon Tamayo Martinez and Adonis Panter Calderon – all members of the celebrated Osain del Monte Orchestra. In the Calle Luz, Fidel dove into the world of the Afro-Cuban cults that summon the gods to purge the spirits of the living. As Fidel jammed, danced and drank it all in, new ideas took hold. What if the voices of this music were replaced by brass? What if the power of ancient ritual was transformed with the sensibility of John Coltrane? What would happen then? Fidel and Thibaud assembled a repertoire to reflect the immense variety of these rhythms and chants, returning to Cuba in late 2017 to link up with friends and plug back into the Afro-Cuban ‘mains’. They surrounded themselves with talented French jazzmen, & when the three Cuban percussionists joined them in Paris, a deeper dialogue was woven. It is the Calle Luz that now also lends its name to the first track to emerge from ‘¿Que Vola?’, a reimagining of Cuban rumba’s Guaguancó genre, which arrives alongside a beautiful film shot in historic Old Havana. The new video tracks the tune’s insidious, percussive groove and bright, taut bursts of horn section to a dawn-to-dusk glimpse into the life & music of Calle Luz. Speaking about the track, Fidel says; “The musical theme played by the wind instruments is a hint to rumba singers – it’s a simple song with only 5 notes. ‘Calle Luz’ is a memory from this place, my first souvenir from Cuba”. So the answer to that question “what’s up?”, is in fact another question: ¿Que Vola? Que Vola? are: Adonis Panter Calderón (percussion); Ramón Tamayo Martinez (percussion); Barbaro Crespo Richard (percussion); Elie Duris (drums); Thibaud Soulas (double bass); Bruno Ruder (Fender Rhodes); Fidel Fourneyron (trombone); Aymeric Avice (trumpet); Hugues Mayot (tenor saxophone); Benjamin Dousteyssier (alto & baritone saxophone). ¿Que Vola? Track-listing: 1. Kabiosilé, greetings to Chango; 2. Nganga; 3. Calle Luz; 4. Que Vola? ; 5. Lyesa; 6. Fruta Bomba; 7. Resistir.